First let me tell you THIS IS A VIP EXCLUSIVE SNEAK PEEK… VERY HUSH HUSH! But just to entice you to come check it out, or to follow along in my InstaStories. It’s my favorite time of year, Spring! It’s a season of birth and renewal as well as Market time. High Point Furniture Market is the largest trade show in our industry and this year I have the privilege of styling the Anna French showroom at Thibaut. Anna French is one of my favorite brands because it celebrates traditional prints, wovens and my oh-so favorite, embroideries! This spring Thibaut asked me to showcase their new Savoy collection through my lens of rich layering of color and pattern. They really gave me free reign to style the collection showing my personal love of antiques and collections set amidst the expressive and moody floral fabric in colors of ink and amethyst with touches of gray and fig. Never before seen swatches straight from the mill!! I am always enamored by an unusual color palette and this one hits all my favorite colors. And, they are the perfect backdrop to the venerable blue and white porcelain. I will have quite a collection of Dutch porcelain from Kim Faison, who’s expert eye I lean on for offering only the best pieces. If you are a designer, please come by and see what I have designed. If you get a chance, I will be in the showroom on Saturday, April 6 from 3-5 pm signing copies of my new book, Enduring Southern Homes, so it’s like a two-for-one! 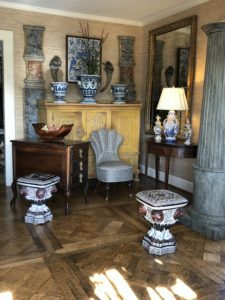 Of course, The space will be chock full of beautifully upholstered Thibaut Furniture show casing the lush fabric shown above, but additionally I’ve curated the most special collection of English antiques from Caroline Faison Antiques, based in Greensboro, NC. 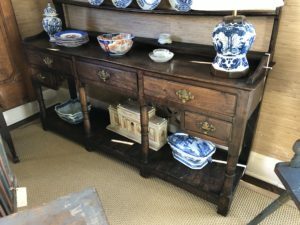 Faison Antiques is truly my idea of heaven on earth, as Ben Cochran, owner and operator of his Grandmother’s namesake store, has the best eye and his pieces are bought all over the world. Ben is my personal search engine for finding the best antiques and curiosities available. They will be hosting a Pre Market Open House and Book signing open to the public on Thursday night, April, 4 so if you are in Greensboro, please come by because I would love to meet you. 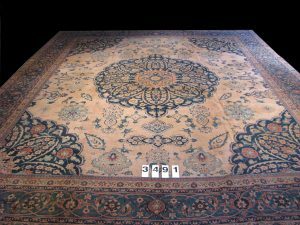 Of course, no room I do is finished without a fine Antique Persian rug and Jubin from Vintage Persian Rugs in Atlanta, GA is allowing me to show a beautiful Tabriz. Rugs are so important to giving a sense of history and gravitas to a room and I find Antique rugs to do this best. I have selected a beautiful open scale floral to bring a level of refinement and formality as a counterpoint to some of the more modern geometric fabrics. Capping off my room is beautiful art from my friends at Wendover Art Group. If you have followed me long on Instagram, you will be familiar with them because I use their beautiful pieces quite frequently. Whether it’s custom framing or using one of their pre-designed art pieces, you can trust them to deliver a high quality and beautiful project. My art will have an Oriental flair, because that is one of my favorite design motifs. Thank you to Thibaut and Anna French for allowing me to design and decorate the Anna French showroom debuting the new Savoy collection. I can’t wait to welcome you to the showroom and talk with you about their new collection and my take on fine living. Hope to see you there!